VATICAN CITY (CNS) — Pope Francis will create new cardinals Feb. 14, following a two-day meeting of the world’s cardinals that will discuss reform of the Vatican bureaucracy, among other issues. Jesuit Father Federico Lombardi, the Vatican spokesman, made the announcement Dec. 11. The names of the new cardinals are likely to be announced in mid-January, he said. If Pope Francis respects the limit of 120 cardinals under the age of 80 and, therefore, eligible to vote for a pope, he will have 10 such openings in February. 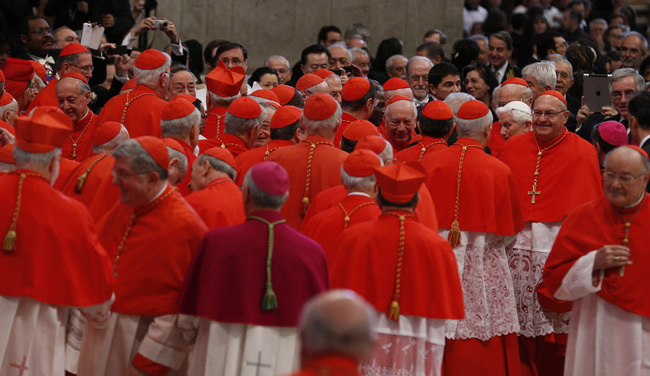 As of Dec. 11, the College of Cardinals had 208 members, 112 of whom were under 80. Retired Indonesian Cardinal Julius Darmaatmadja of Jakarta will turn 80 Dec. 20 and Italian Cardinal Giovanni Lajolo has his 80th birthday Jan. 3. On the same occasion, Pope Francis may also follow precedent by creating a number of cardinals over the age of 80, churchmen being honored for their contributions to theology or other service to the church. In accordance with recent tradition, the pope will bestow red hats on the new cardinals Feb. 14 and then celebrate Mass with them in St. Peter’s Basilica the next day. His creation of new cardinals will follow a consistory or meeting of the entire College of Cardinals Feb. 12-13. In February 2014, the pope called such a meeting to discuss the theme of the family, as part of the preparation for the extraordinary Synod of Bishops on the subject held in October. The theme for the next consistory has not been set yet, Father Lombardi said, but the Council of Cardinals advising the pope on reform of the Vatican bureaucracy will brief their fellow cardinals on their progress in drafting a new constitution for the church’s central administration, the Roman Curia. The spokesman echoed a recent statement by the pope that the reform process was moving slowly, and would not be completed before 2016. The nine-member council, known as the C9, will meet for its usual bimonthly session Feb. 9-11. Its previous meeting took place Dec. 9-11. The cardinals’ meetings will come on the heels of a meeting of the papal Commission for the Protection of Minors, which coordinates the church’s efforts to prevent the sexual abuse of children. The commission, which is headed by U.S. Cardinal Sean P. O’Malley of Boston, currently has nine members, including its secretary, U.S. Father Robert W. Oliver. Father Lombardi said the membership will have doubled to 18 by the February meeting, in an effort to expand representation beyond Europe and North America. The names of the nine new members have not be published.